Long before you give birth to your beautiful new baby, chances are you’ve already given plenty of thought to what your baby will wear on the way home from the hospital and the days that follow. Determining just how to dress your infant can be a difficult task for new parents. You will likely receive plenty of clothing items from family and friends. Though well-meaning and a nice gesture, you may find that some of the clothing is not needed or is out of season for the baby’s size. It can be overwhelming to sort through all those clothes trying to find the basics for your infant. There are a few simple steps parents can take to make sure that they have covered all the basic clothing needs for their infant. Infants will need certain essential items during the different seasons of the year just as adults do. Familiarize yourself with the essentials that your infant will need for the different seasons. Layer it up during the wintertime. When adults go out in the winter, they may wear an undershirt, a sweater, a jacket, a scarf and a hat. It is important to know that your baby needs the same amount of layers as well. Make sure that your baby has a warm hat that fits his head snugly but is not too tight. A proper fitting jacket is also important. If the baby’s head and arms are warm, that will help warm up the rest of his body. Invest in a good pair of gloves or mittens for your baby to keep his hands warm. Carry a warm blanket with you so if you are transporting your baby between the outdoors and into an indoor setting, you can cover him with the blanket to block the cold wind. Protect your baby’s delicate skin from the sun during the hot summer months. Summer can be a tricky time for dressing infants because they can overheat very quickly. Heat and extreme humidity can cause them to develop a heat rash or heat stroke quickly. Make sure to keep a sun hat handy to keep the sun off your baby’s face. Protect his sensitive skin with a good sunscreen approved for infants. 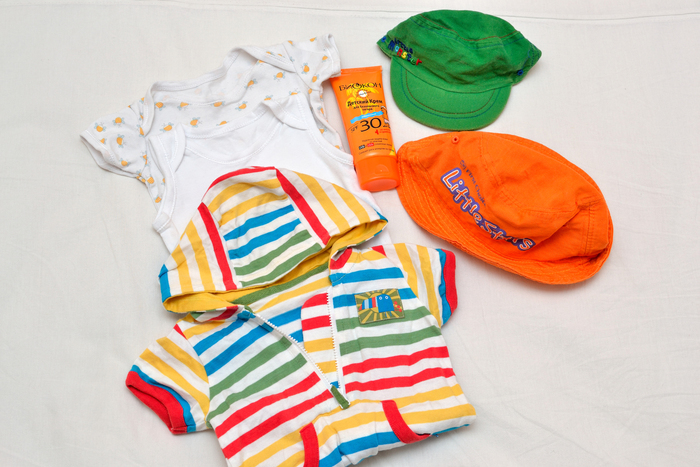 During the summer months, it is important to dress your baby in clothing that will allow his skin to breathe. Make sure that you are not dressing him in any constricting garments or heavy fabrics. Instead, choose clothing that is loose-fitting and lightweight. Selecting lighter colors will also help to block some of the heat. 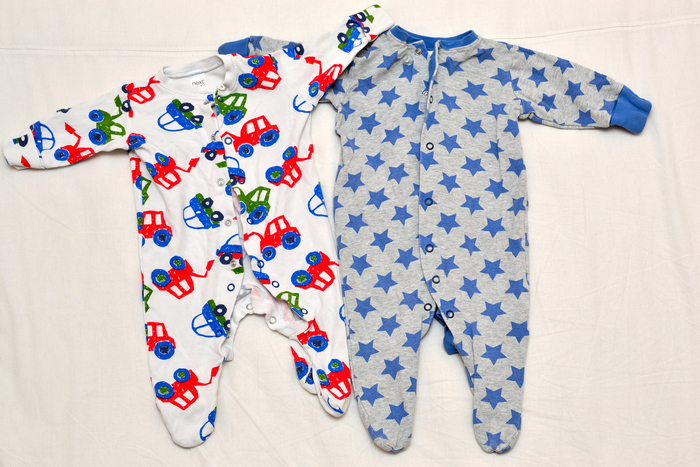 There are a few key items that are staples in an infant’s wardrobe. Be sure to stock up on them and have plenty available since you are likely to go through many changes in the early days when you bring your baby home from the hospital, thanks to leaking diapers and spitting up. Invest in 8 to 10 good quality, one-piece undershirts, or 'onesies'. These all-in-one t-shirts are placed over the infant’s head and close with snaps at the bottom. They easily unsnap, allowing for easy diaper changes. Stock up on one piece outfits that have either snaps or zippers up the middle. These one piece garments are practical and usually very affordable. They come in a variety of cute designs and make diaper changes very easy. Purchase a few pairs of socks and newborn caps to keep baby’s head and feet warm when indoors. Even on warmer days, baby’s tiny feet can become cold because an infant does not yet have good circulation. On days when your baby is not wearing a one piece outfit that cover the feet, a pair of socks may be all that is needed to keep his feet warm rather than using a blanket. Newborn caps are lightweight and will keep baby’s head warm on cooler days without causing him to overheat. It is very important to make sure you buy the right clothing for your baby’s bedtime. An infant can have a fluctuating body temperature, especially when sleeping during the night. 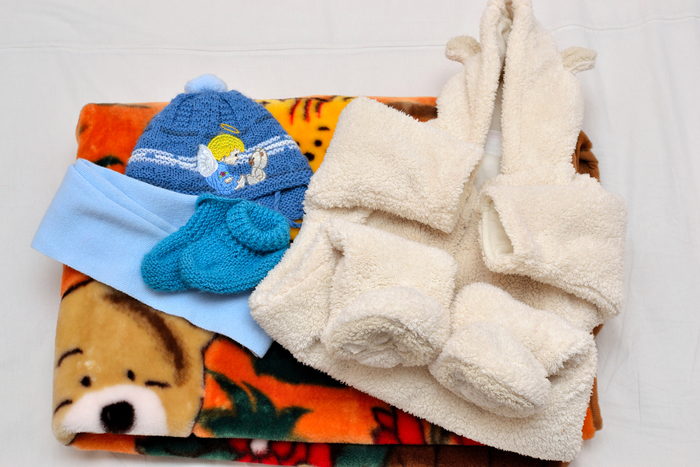 Make sure you are dressing your baby appropriately to accommodate these fluctuating temperatures. Dress your infant in clothing that will keep him warm even without the use of a blanket. Blankets are not recommended for infants as they are a suffocation hazard and are believed to be a risk factor for developing SIDS. Additionally, your baby could roll over during the night and get out from underneath their warm blanket, leaving their bodies exposed to the cool air. If you dress him in warm clothing with a couple of layers, you can take a layer off to adjust to the changing temperature if the baby becomes too hot. Avoid covering your baby’s head when he is sleeping. This is a serious suffocation hazard and can also cause him to overheat very quickly. Certain hats or bonnets can cause your baby to choke so it is best to avoid all head coverings when placing the infant down to sleep. 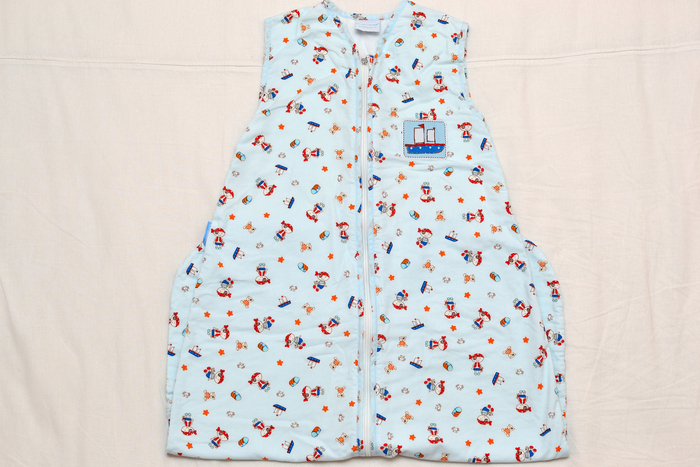 Invest in a sleeping bag that is made especially for infants at bedtime. If the sleeping bag is the correct size, it can help protect your baby from SIDS by keeping his head and face uncovered. The sleeping bag can also keep your baby from rolling over and ending up on his stomach while he is sleeping. Be sure to dress your baby appropriately for sleeping in the sleeping bag. You may not need as many layers of clothing because the sleeping bag will keep the warmth in. Try swaddling your baby in a wrap for bedtime. Wraps are designed to swaddle your infant in the same way you would swaddle him with a blanket, keeping his arms held tightly against his body. These specially designed wraps provide the same comfort as a swaddling blanket without the dangers associated with blanket use at bedtime. Using a wrap can help get your baby settled for bedtime and can also make sure he is safely sleeping on his back. As long as you keep the wrap away from his head, it can make your baby feel very comfortable while keeping him very warm. Always be aware of your baby’s body temperature, especially when dressing him for bed. Babies can’t control their body temperature so it is important to make sure they are not overheated. Don’t overdo it when it comes to buying essential clothing for your infant. Babies grow so quickly and will grow out of their clothing. If you buy too much, your baby may not even get to wear it before he outgrows it. Just stick to essential items as well as some trendy items for special occasions. It is important not to overdo the layers. Babies can overheat quickly and when they are wrapped too tightly in layers they are at a greater risk for developing SIDS (Sudden Infant Death Syndrome). Check your baby often and if you see him starting to perspire too much, simply remove some of the layers and let him cool off.